Struggling malls and blighted strip retail need help! But unless you fundamentally change the stroad on which those uses were built, don’t hold your breath for much change. 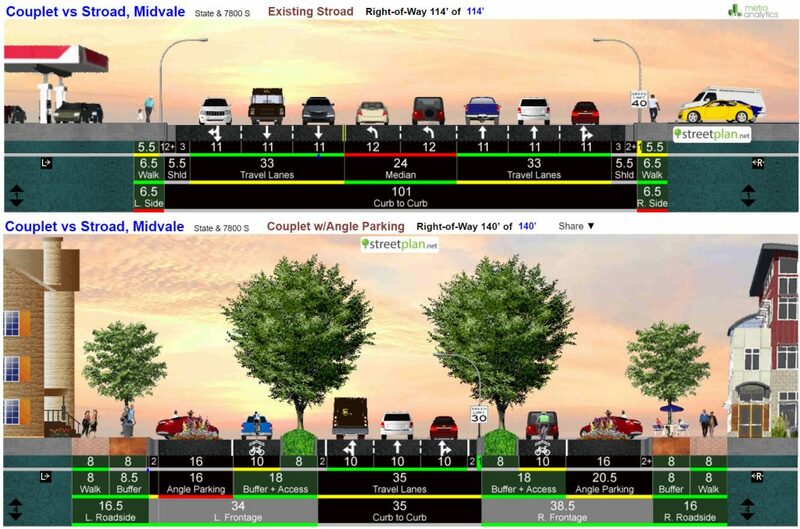 To catalyze change, planners create Road Diets and Complete Street cross sections, but often meet strong resistance from engineers who believe it will cause unacceptable delay for drivers. This article explores using one-way couplets to help vehicles drive slower, but travel faster, and thereby satisfy engineers. And at the same time greatly improve the mixed-use attractiveness of otherwise irredeemable stroads, and thereby bring premium development back to greyfield locations. 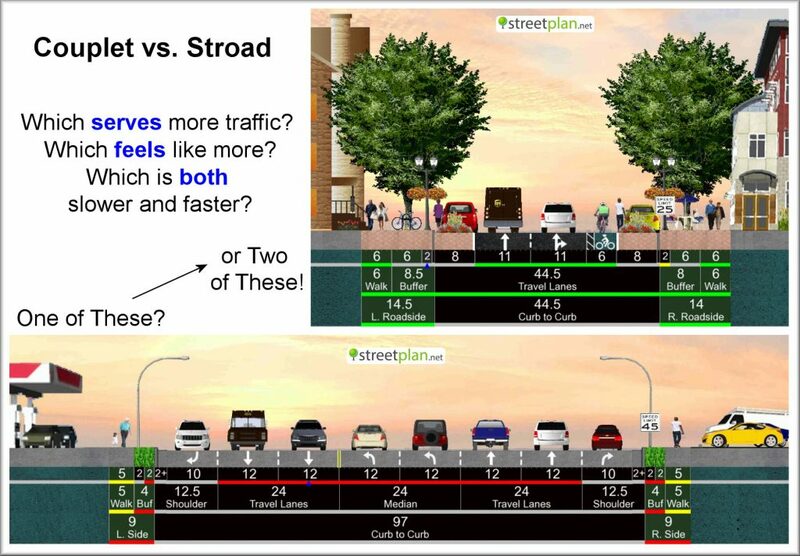 In many cases, it should be possible go from a fiscally net-negative stroad to two net-positive Complete Streets, without creating delay for drivers: an essential element for coalition-building. After these conceptual examples, please read my defense of why these are a great way to create win-win for both land use and transportation. This location has light rail, and nearly all parcels are fully ripe for redevelopment. 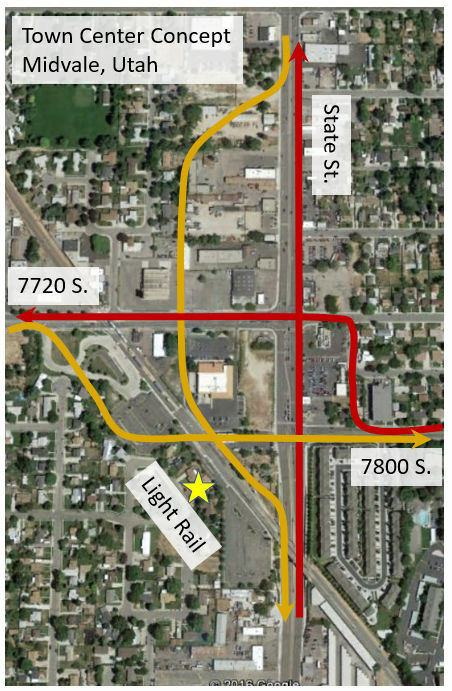 Crossing couplets (Calthorpe’s Town Center model) would solve a bad jog where high traffic currently “doubles-up” on State for a block, transitioning from 7800 South to 7720 South. Below are StreetPlan.net cross sections that help reveal the potential relative to existing stroads. Notice than my reinvented one-way State Street is 26′ wider than the present two-way stroad, but that’s because I made it a multi-way boulevard with angled parking on both sides. You could easily stay within today’s right of way with parallel parking. But even with expansion, it’s better use of land because there is less need for off-street parking, so more of the area can be buildings. Declaring it a redevelopment area, then working to scrape the majority if not all of it, would make it easy to expand for such angle parking. Now there would be four modest intersections with 16 popular corners, rather than a single HUGE stroad intersection with just 4 popular corners. The design keeps the same overall through lanes, and traffic signals are simpler and will have less delay. That means you can reduce the speed limit from 40 to 30 mph, and drivers will still get through faster. That is KEY to getting the DOT to agree to this. And because traffic is far more efficient, this system can probably support, without congestion, localized densities that are 5-10 times would otherwise be supportable without congestion. And instead of highest land values concentrated on just State, it is now spread across many more parcels. This is a typical retail area near a freeway interchange. It has HUGE amounts of peak-period traffic because of the freeway. How can this area become attractive for walkable development, but still accommodate the traffic that isn’t going away anytime soon? If we split the stream as shown with the red and orange lines, then Redwood becomes less than half as large as it is now. The orange alignment for southbound trips is mostly available today, but would require taking some low-value buildings. 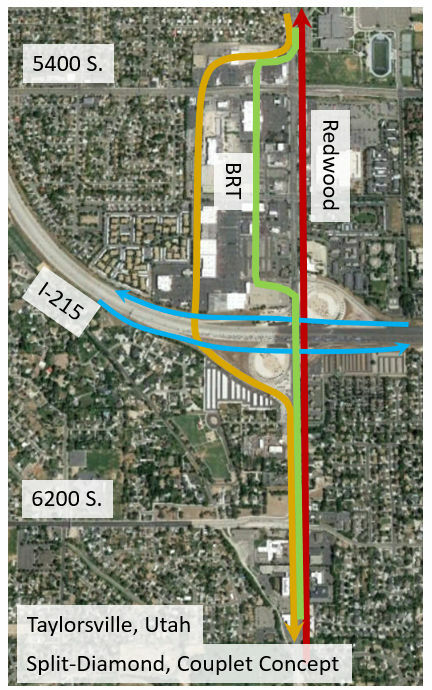 It would require a new underpass for I-215 and a “split diamond” configuration, but that would also greatly improve traffic management and release two huge circular ramps for redevelopment, at least partially covering the cost of the project. There are hopes of a BRT on Redwood someday, and this would create a chance to route it on a middle “bus only” pedestrian mall, similar to Denver’s 16th Street Mall. Is this best practice if you could start all over? No. But is it the best marriage of land use, autos, and non-auto modes that can be politically achieved given the reality? Maybe so. These changes would be expensive, but as before, they can probably allow this location to achieve up to 10-times the density it could otherwise achieve. That’s a value-capture opportunity wherein it may be possible to get private development to pay for most of the costs in trade for a favorable situation that can help them make it worth the investment. The previous examples where for Everywhere, USA strip retail. But there are also many traditional malls that are in trouble. Below is a mall in Nebraska that is on this “in trouble” list. I took liberty to explore an idea for utilizing a one-way couplet as a means of humanizing the Dodge Street stroad for mixed-use redevelopment both north and south of Dodge. The solid red path could potentially impact just a few very small buildings. The mall itself could stay if there is a good adaptive reuse strategy. Like earlier examples, this would replace huge stroad intersections with smaller, simpler intersections, and that would reduce delay for drivers, making it easier to lower speed limits without actually lowering average speeds. When suburban retail corridors decay so much that they no longer generate enough in sales+property tax to cover their own maintenance, that’s a problem. Narrowing lanes can help gain a few feet for rejuvenation features, but unless you can drop a lane, you may not gain enough space back from autos to impressively improve the bike/ped realm, and thereby establish a pedestrian-oriented land use expectation. Couplets can create win-win when maybe nothing else can. You’ve probably heard the “consensus” that one-ways are always bad. Don’t believe it. They can be a great tool for humanizing auto-oriented stroad corridors that have no grid, too much traffic, and are otherwise almost unsalvageable. The anti-couplet crowd is primarily focused on humanizing historic locations that DO have good grids, and in their zealotry, have inadvertently labeled one-ways as the wrong-way for all situations. Comparing pre-war historic grids against post-war suburbs, it’s a little like comparing an 85-year old who has eaten well and gotten great exercise to a 60-year old who now has heart disease and diabetes from decades of poor habits. The effects of a lifetime on the latter mean the best option now is surgery. Should one-way streets be a part of pre-war grids? That’s a debate for another day. But hopefully you can see they may well be effective “surgically appropriate” tools for helping our sick suburban greyfields get a second chance at life! (or livability). TownCenterIntersections.org has some existing locations, along with videos, articles, and other links. Top-10 Arguments Against One-Ways, Addressed: Rebuttals to common arguments against couplets. If you think this topic is important, please Share!